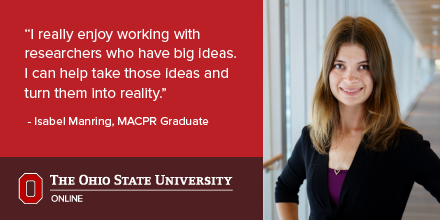 Isabel Manring is a graduate of Ohio State’s online Master of Applied Clinical and Preclinical Research first cohort. We got together with her to reflect back on her time as a student. Originally, I am from Germany, and I first started studying in the United States back in 1998. I decided to continue my education in the States because of the high unemployment rates that Germany was experiencing. I obtained my Associates of Science from Columbus State Community College where I graduated as valedictorian. From there, I went on to get my Bachelor of Science in Microbiology and finally, my masters. Why did you decide to pursue the Masters of Applied Clinical and Preclinical Research degree program? In research, there are a lot of clinical positions where you are thrown into the deep end without much background knowledge. I needed a solid foundation of clinical research overall to understand how to excel at a career in the field. I wanted to know why certain practices were implemented and how they affect everyone’s role in the field rather than just following it because I was told. The program helped me understand my colleagues’ points of view and how different aspects of clinical research work together to support the process and the safety of patients. As a graduate of the first cohort, how has the degree program benefited you? Basic research is always searching for new pathways for medications and treatments for cancer. This degree program has helped me excel at performing my operational job duties so that I can spend more time seeking out those opportunities. A lot of what I learned I applied to real life situations such as data management and budgeting models. I really enjoy working with researchers who have big ideas. I can help take those ideas and turn it into reality with the knowledge and experience I have gained from the program. The Master of Applied Clinical and Preclinical Research online program prepares graduates with the skills to conduct, manage and regulate clinical and preclinical trails. Visit online.osu.edu/macpr to learn more.